For more than 30 years AES has applied and removed media labels for our customers. At AES, we realize how critical the process is to insure the tapes are labeled with the correct volume serial number. There is no room for a mistake. We have implemented a system for removal and application that virtually eliminates the chance of error. We label all types of media in any environment. Whether it is new media, certified media, existing media, RFID labels, onsite or at an alternate location, AES has the expertise to make sure that careful consideration is taken and quality and accuracy are achieved. 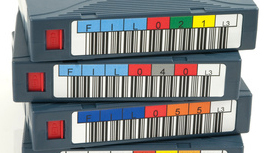 AES provides barcode & RFID labels for any tape media including 3480, 3490, 9940, 9840, 3592, 3590, T10000, SDLT and LTO I/II/III/IV/V plus special color codes to meet all your tape labeling requirements. Making sure that you purchase the correct label with all the different types of media and hardware systems in the marketplace can become very confusing for many customers. At AES we take pride in making sure you receive the right label each and every time. Whether you simply need the labels sent to your location, or you require additional services such as initialization, AES can provide the service.